Well this came out of nowhere. 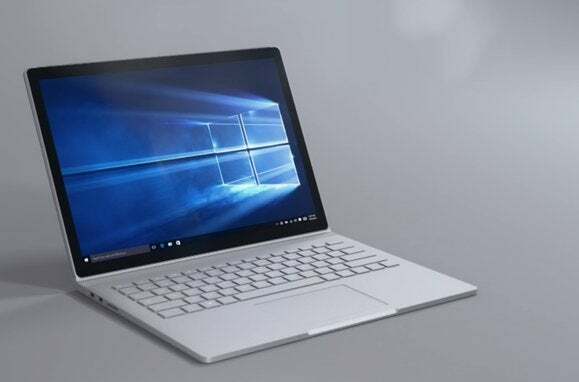 After years of pleading from PC enthusiasts, Microsoft finally revealed an ultra-premium Surface laptop, dubbed Surface Book, at its hardware event on Tuesday—a portable PC designed to embrace Windows 10’s most cutting-edge features, and one that’s just oozing style. If the Surface Pro is a tablet that can replace your laptop, as Microsoft’s marketing crowed last year, does that make the Surface laptop a laptop that can replace your tablet that replaces your laptop? Not quite. Both aim for different targets. While the Surface tablets were initially introduced to highlight the sort of mobile 2-in-1 experiences possible with the touch-friendly Windows 8, the 13.5-inch Surface Book showcases what traditional PC makers can achieve with Windows 10. 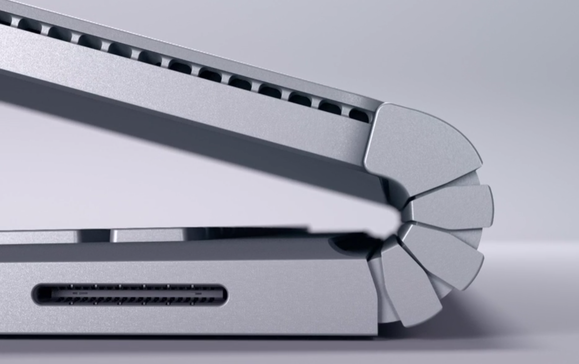 Despite all the laptop talk, the Surface Book is a detachable 2-in-1 device as well, with a Lenovo Yoga-like “dynamic fulcrum” hinge that provides rigidity and flexibility thanks to “muscle wire” technology created by Microsoft. But don’t let that fool you: “This is designed to be a laptop, the ultimate laptop,” says Panay. And he’s not fooling. The Surface Book packs sixth-generation “Skylake” Core processors, all the way up to a beefy Core i7, with up to 1TB of storage and 16GB of RAM. What’s more, the keyboard base packs an undisclosed Nvidia GeForce GPU powerful enough to let Panay play Microsoft’s upcoming Gears of War game right onstage. 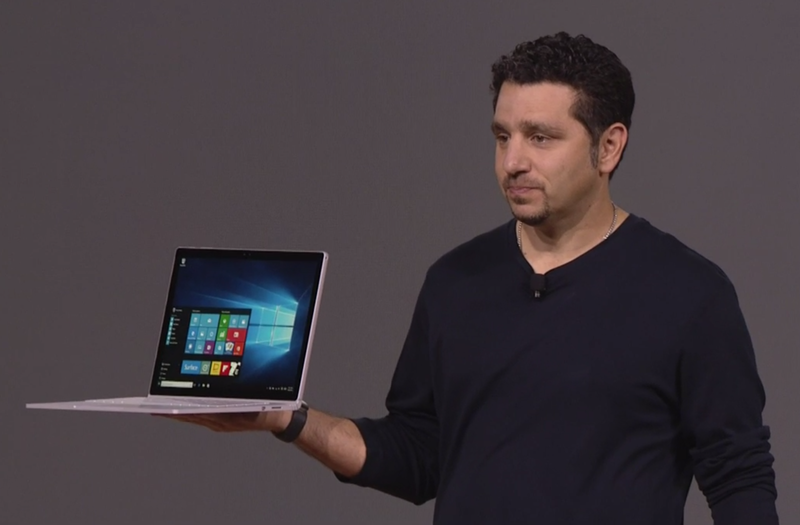 Between the CPU and GPU, Panay says the Surface Book delivers twice the performance of Apple’s MacBook Pro. Ounce for ounce, Panay said, the Surface Book is the most powerful 13-inch laptop ever created, yet it still offers up to 12 hours of battery life. The Surface Book’s display packs all the same fancy bells and whistles as the Surface Pro 4, like 0.4mm cover glass for superb touch responsiveness. The 13.5-inch screen’s packed with 6 million pixels, for a slick 267 pixels-per-inch experience. But a laptop’s reputation lies in its keyboard. Microsoft leaned on its years of experience in making keyboards when designing the Surface Book, Panay said, to create a backlit button array with 1.6mm of travel, and a glass touchpad that was optimized by the Windows 10 team for finger-friendly precision. 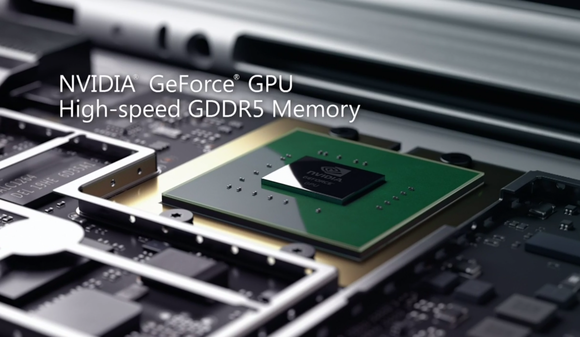 Beyond the Nvidia GPU, the keyboard base also contains a pair of USB 3.0 ports and an SD card connection. Moving the ports to the base allowed the Surface team to make the Surface Book’s detachable display even thinner than the Surface Pro 4, measuring a scant 7.7mm and 1.6 lbs. Damn. This device looks hot. Look for PCWorld’s review in the coming weeks, or go check out our initial hands-on with the laptop, but if you can’t wait, you can preorder the Surface Book on October 7 with prices starting at $1500. 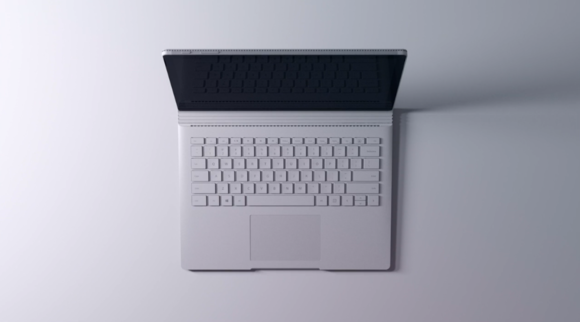 The notebook will actually hit the streets on October 26, just like the Surface Pro 4.